Plot - A romantic adventure film about two misfits who stole a white Rolls Royce and go on an adventure discussing love and happiness. After car-jacking a white Rolls Royce, Gus picks up Ruby who is pretty tattoo artist. Both of them drive to the woods escaping the city lights and smoke joints and discuss about life and how awesome 70s was. Ruby warns him not to fall in love with her but when you are high, that is the only thing you cannot do. 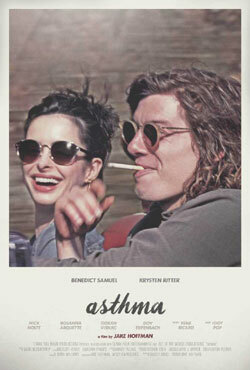 Box Office Earning of "Asthma"